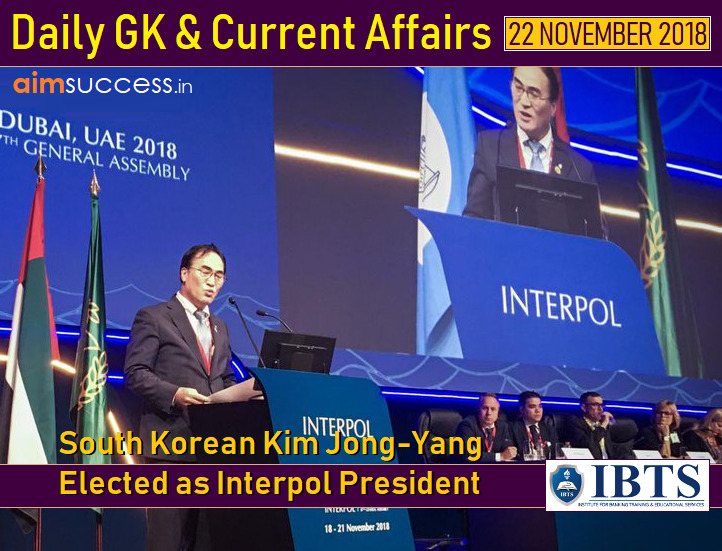 South Korea Kim Jong Yang has been elected as the Interpol President for a two-year term. The decision was taken at the 87th General Assembly of the Agency in Dubai (first time) UAE. He replaced Meng Hongwei (Deputy Minister of Public Security of China) who is alleged to have resigned via an undersigned postal letter (in October 2018) after his detention and disappearance by Chinese authorities on corruption charges. The Interpol General Assembly brought together officials of public security departments and global experts to discuss vital safety and security issues. The International Criminal Police Organization (INTERPOL) is the international organization that facilities international police cooperation. It chose INTERPOL as its telegraphic address in 1946 and made it its common name in 1956. Jammu and Kashmir Governor ‘Satyapal Malik’ dissolved the State Assembly after rival alliances staked claim to form the government. Earlier, the state assembly was kept in suspended animation so that political parties could explore the possibility of forming a new government. The Governor's rule was imposed in the state on 19th June for a 6-month period following the collapse of the PDP-BJP coalition government after BJP withdrew its support. The State will now be placed under President's rule on December 20 after the six months tenure of Governor's rule comes to an end. The state went to polls at the end of 2014 and the Assembly's tenure was till October 2020. The Gujarat government has launched Rs. 351-crore project for the conservation of the Gir lions. The project is launched in the backdrop of the Canine Distemper Virus (CDV) outbreak that claimed 23 Asiatic lion lives in their only dwelling Gir National park in Saurashtra. This intensive project will also include an emergency ambulance van akin to the 108 emergency services. Canine distemper is a viral disease that affects a wide variety of animal families, including domestic and wild species. The Union Government of India and the World Bank have signed a USD 310 million Loan Agreement for Jharkhand Power System Improvement Project (JPSIP) to provide reliable, quality, and affordable 24x7 electricity to the citizens of Jharkhand. The Project is part of the Government of India’s Power for All program launched in 2014. The plan envisages addition of over 4.5 GW generation capacities by 2022 (including a significant share of 1.5 GW from solar energy), through a mix of Private and Public-sector investments. As per data from the Jharkhand Distribution Company, more than 80% of all citizens in the State have access to electricity. Today, The Open Forum has begun at International Film Festival of India in Panaji, Goa. The Open Forum provides a platform to filmmakers, actors, jury members, senior government officials, and organisers of film festivals from India and abroad to exchange their views in a free and frank manner. Open Forum is an integral part of the International Film Festival of India (IFFI) for the past 30 years. This year’s Open Forum has been organised by the Federation of Film Societies of India in collaboration with Directorate of Film Festivals and ESG. The Open Forum was introduced at the Thiruvananthapuram Filmotsav in 1988. The Union HRD Minister Shri Prakash Javadekar has launched (through video conferencing) the ‘Institution’s Innovation Council (IIC) program under Innovation cell of MHRD in New Delhi. It is a significant step in institutionalising innovation and developing a scientific temperament in the country. The HRD ministry has established an “Innovation cell” at AICTE with a purpose to systematically foster the culture of Innovation in all Higher Education Institutions (HEIs) across the country. The objective of the formation of a network of Institution’s Innovation Councils (IICs) is to encourage, inspire and nurture young students by exposing them to new ideas and processes resulting in innovative activities in their formative years. The IIC network managed by MHRD’s Innovation cell to promote innovation through multitudinous modes leading to an innovation promotion eco-system in their campuses. Prime Minister Narendra Modi laid the foundation stones of City Gas Distribution (CGD) projects in 129 districts from New Delhi. It will herald the availability of convenient, environment-friendly and cheaper natural gas for almost half of the country's population spread across 26 States and Union Territories. Till September 2018, 96 cities and in different parts of the country were covered for development of CGD networks. President Ram Nath Kovind met Australian Prime Minister Scott Morrison in Sydney to facilitate bilateral investment flow in both countries. Five MoUs were exchanged in the field of disability sector, education, trade-investment, scientific cooperation, agriculture and on higher education focussing on PhD by both nations. The MoUs were exchanged by High Commissioner of India to Australia Ajay M Gondane and High Commissioner of Australia to India Harinder Sidhu. The President will also address the International Business Summit 2018 organised by Australian Financial Review on Australia-India economic engagement. Nepal’s Minister for Physical Infrastructure and Transport Raghubir Mahaseth has inaugurated an exhibition of construction equipment and technology- ‘ConMac 2018’ at Bhaktapur (near Kathmandu) in Nepal. The Embassy of India in Nepal and CII (Confederation of Indian Industry) jointly organized this exhibition of construction equipment and technology- ‘ConMac 2018’. The objective of the exhibition is to further enhance high-level engagements between construction industry of the two countries. Noted Social activist and former BJD MP Baishnab Charan Parida (77-year) passed away in Bhubaneswar, Odisha. He served as the BJD member in Rajya Sabha from 2010 to 2016. Earlier, he was the President of the Odisha unit of Samajwadi Party form 1999-2018. India, US Joint Special Forces Exercise 2018 named ‘Vajra Prahar’ commenced at Mahajan Field Firing Range (MFFR), Bikaner in Rajasthan. The 12 days exercise was called between Special Forces of both countries to deal with operations for counter-terrorism and is being done at the unit as well as sub-unit levels. US Army is represented by the contingent of one officer and 10 Other Ranks from Special Forces Group of United States Pacific Command. They will carry out rigorous joint training in semi-desert and rural terrain with an aim to enhance interoperability of the two-armed forces and further military to military co-operation.